Lynn Naismith's paintings are exhibited in galleries in Victoria, Queensland, New South Wales and the ACT. Born in 1942 Lynn grew up in the pristine bushland setting of the Woronora River on the outskirts of Sydney, New South Wales. These early years instilled in her deep and lasting bond with the bush and its wildlife, but it was the birds particularly that captured Lynn's imagination and from an early age encouraged her to develop her natural drawing skills. 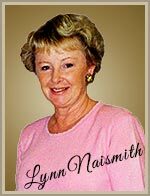 During the 1960's Lynn travelled and lived overseas for several years. On returning to Australia she and her husband settled in Sydney to raise their son and daughter. It wasn't until the late 1980's that Lynn had the time and the freedom to experiment with water colours, and even though she had never received formal art training, her work soon came to the attention of Gallery directors. Sydney based Lesley Suzanne Davies is an award winning artist best known for her delightful images of Australian birds and animals. She has also painted and illustrated a wide range of subjects including children's books. 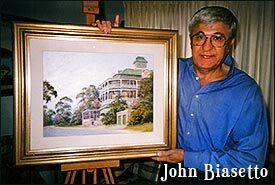 John Biasetto's paintings are regularly exhibited in art galleries and charity art shows in south-eastern Australia. His paintings are in many overseas private collections, including collections in Italy, Switzerland, the US, the UK, Singapore and Japan. Art collectors greatly admire the idyllic calm portrayed in John's river scenes. His paintings of Sydney Harbour, the Hawkesbury River and, especially, the Cook and Georges Rivers have proven to be very popular with art collectors. John Biasetto was born in 1932 in Venice, Italy, immigrating to Australia when he was 18. He studied drawing at a technical college in Italy. After coming to Australia, he studied Art for at the Gymea Technical College. Eventually his interest in art motivated him to buy the Saints Art Gallery in Carlton, Sydney in 1988 which he ran until 1999 when began his pursuit of art full-time. Roger Connolly's drawings and paintings are in many private and corporate collections, including the collections of members of the British Royal Family. Roger graduated in Architecture from Oxford Brookes University, UK in 1990. He practised briefly as an architect both in the UK and in Australia before becoming a full-time artist.